Just over a year ago, we released our new WJ Client Investment Portal to replace our printed quarterly statement. Since that time, over 75% of our clients have logged into their portal. The feedback from clients regarding the portal has generally been positive, but we understand that it contains a lot of information sometimes making it difficult to find what you are looking for. Over the next year, we will be offering numerous training opportunities to make the portal as useful as possible. We have also heard that some clients continue to rely on their Schwab statement and website to evaluate their portfolios. 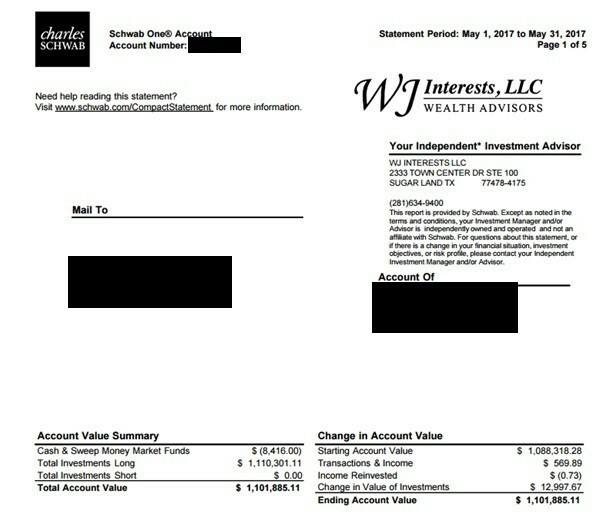 The purpose of this WJNotes is to show you why the WJ portal should be your first choice when reviewing your portfolio. In looking at the screenshot, the first thing that should stand out is the colored tiles. These 5 tiles cover what we feel are clients most common questions. How much do I have invested? How much have I made since I’ve been a client (in dollars and as an annualized percent)? How much have I made this year? 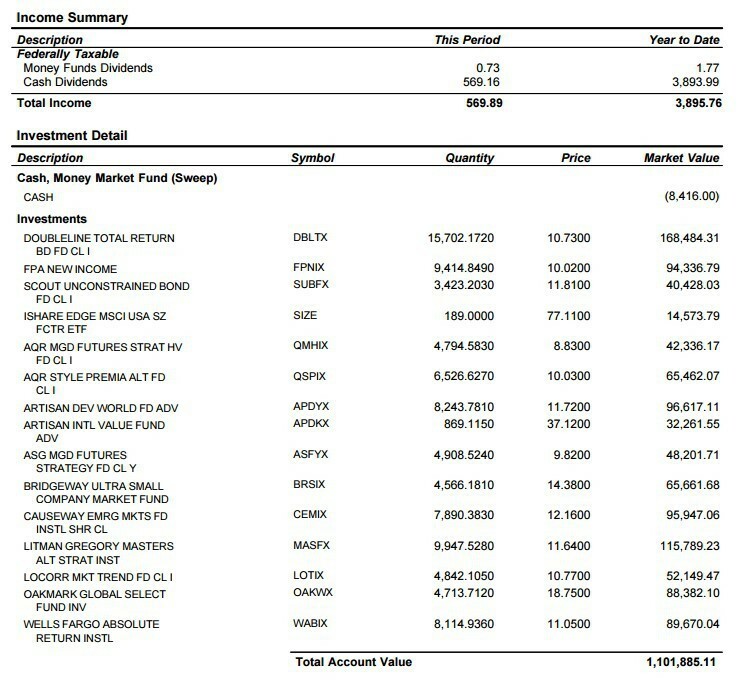 What have I added or withdrawn from the portfolio since I have been a client? These questions can be answered on this page and will be updated daily! First, these statements are only at the individual account level. We do not manage each account as its own portfolio. We group together all your accounts, and invest based on the total value of all of them. Therefore, individual account performance ignores the investments in the other accounts which make up your portfolio. Second, this statement does not provide performance information. The starting and ending account values are shown but it is not obvious why the account value changed. The only way to truly evaluate performance is to segregate your contributions from investment performance. This is directly shown on our portal in a consolidated fashion. The Schwab statement also contains no benchmark information. We have always stressed the importance of comparing your portfolio performance to something. The portal contains not only individual benchmarks for major asset classes, but also a blended benchmark representing a client’s risk tolerance. The statement does show you current holdings but they are not classified by primary asset class (i.e. stock or bond) or secondary asset class (i.e. US large stock, US small stock). Your basis is also not shown in the report. Whereas the portal contains extensive information on holdings, asset allocation and once again compares it to an appropriate benchmark. Most brokerage statements are designed to meet the minimum regulatory disclosure requirements. They are not designed for evaluating performance and portfolio positioning. We have specifically designed our portal to provide this information. The client investment portal should be THE FIRST PLACE clients go when they have questions regarding their portfolios. In addition to the tiles mentioned earlier, the client investment portal contains numerous other reports with detailed information. We believe the client portal is a great asset for our clients and are always available to guide you – whether you are accessing the portal for the first time or would like to learn about some of the more detailed reports, please feel free to call us.